J. Thomas Electric | We do it Right the first time! Welcome to J.Thomas Electric! 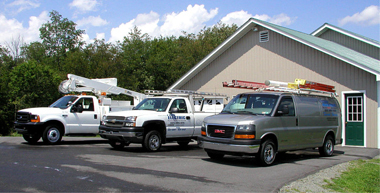 We are electrical contractors located in Tunkhannock, Pennsylvania, serving Bradford, Carbon, Columbia, Lackawanna, Lehigh, Luzerne, Susquehanna, Wyoming, and Sullivan Counties. We specialize in residential, commercial, and industrial installations, as well as instrumentation and process control. Our employees have 75 years combined experience including a degree in electrical engineering, journeyman and master electrician licenses, process control, instrumentation, & lighting experience, as well as outstanding work ethic and talent. We take pride in the quality of our work and ensure that every project is done right the first time. We welcome you to take a look at some of the projects we've completed in the portfolio section. For more information, navigate to the about us section or view some of our electrical installations. Please contact us at any time via email or phone at (570) 639-3047. We are an American Home Shield and Home Service USA repair company.